Lakenvelder chickens have many of the temperaments common with foragers. Owners describe them as quick, intelligent, wary, and at times flighty. Foragers survive by their wits. They love to forage but will adapt to confinement. Lakenvelder chickens get along with each other in close quarters. The word “Lakenvelder” describes the general appearance of the breed. It literally and poetically translates as “shadow on the sheets.” Lakenvelders in general have a white body with black hackles and tail. 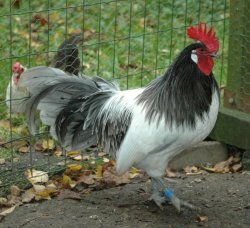 The roosters may have a black and white mix on their saddle feathers. The hens sometimes have white feathers mixed in their hackles. The American Poultry Association (APA) only recognizes the Silver Lakenvelder. Europe accepts other configurations such as the Golden Lakenvelder and Blue Lakenvelder known as the Vorwerk. The Lakenvelder averages four or five pounds. The smaller version average two pounds. As egg layers Lakenvelders need calcium and protein supplements to their diet. Feed them a good layer food. Lakenvelder forage great distances. Give them as much room as you can afford. They will reward you with lower feed costs. An active breed, the Lakenvelder lays much and broods little. They make the perfect egg layer except if you want to propagate the breed. Bring in a good brooder from another breed or an incubator for hatching. Although adaptable, provide a well-insulated, draft free coop for your Lakenvelders.